I have lived in Warrington for nearly 3 years and this years was the first time I was able to go to the Manchester Christmas Markets. I love christmas markets, they really make me feel all christmasy and festive and just all warm and sparkly inside. Paul had been before with his family but this was our first time going together. We both wanted to drink so we decided to get the train in, it wasn't too bad but the train was packed even tho it wasn't rush hour. We got the tram from Piccadilly station and got off near Manchester town hall. I didn't really know what to expect as being from Birmingham our market is all along one street but Manchester's is broken up into little markets all over. I honest have to say I like that, as the crowds are a lot more spread out and so instead of fighting your way through like in Birmingham you get to see a lot more and have a nicer time. 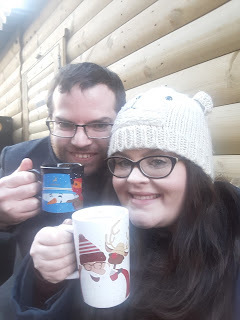 First things first was obviously a nice hot drink, Paul got a mulled wine and I got a Baileys Hot Chocolate. You pay a deposit of £2.50 for your mugs and if you don't want to keep them you get your money back when you hand in your mugs. Both me and Paul like collection the mugs from different markets we go to so we kept ours. Mine was bigger which I thought was funny as I went for Hot Chocolate. Next stop was the famous Yorkshire Pudding wraps. I saw these on Facebook and I told Paul that I needed to hunt them down as soon as we got the the market. We found them and stood in line, I think we must have got there at the right time because it wasn't too long before we were at the front, by the time we sat down with our food the line was huge. 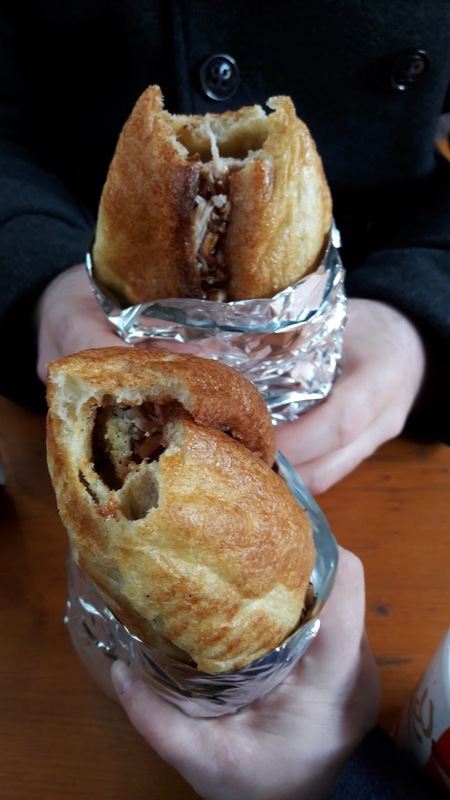 If you have no clue what I am talking about, the wrap is a huge Yorkshire pudding, with stuffing, a choice of either Turkey or Beef, carrots and peas, and topped off with a large scoop of gravy, all wrapped up like a tortilla, and put in foil, it was LUSH!!!! I said to Paul I could have done with some cranberry sauce, they did have some but I forgot to ask them to put it on. It was very expensive £7.50 each, but trust me it is so good it is worth it. We ate our food then had a proper good mooch round having a couple more mulled wines and Baileys Hot Chocolates and made our way around the rest of the markets, it was really such a good day, it was cold but we kept warm and like I said before with the market stretched out it broke up the crowd. If you get a chance to go do it, you will love it.